Clement L. Hirsch; Iotapa Living Up to Her Spectacular Pedigree: All the time we see horses get better with age, and Iotapa is no exception. Breaking her maiden in her only start at two, she came back in allowance-company to begin her three-year-old year. 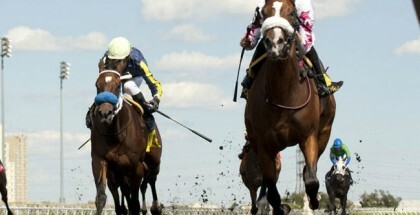 She once again won her race, before her trainer John Sadler threw the filly into grade one competition. She had a fantastic race, and finished behind the two-year-old and three-year-old champion of 2012 and 2013, Beholder, in the Santa Anita Oaks. She finished ahead of Fiftyshadesofhay, whom she will be facing again this weekend, in the Clement L. Hirsch on Saturday, August 2, 2014 at Del Mar. Iotapa, pictured above, teams up with jockey Joe Talamo for the Clement L. Hirsch Handicap at Del Mar on Saturday, August 2, 2014 for trainer John Sadler. 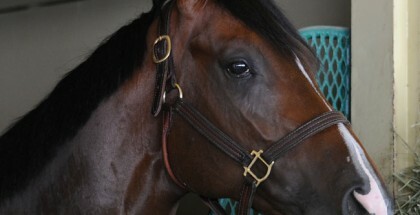 Iotapa is a four-year-old filly by champion Afleet Alex, who we all know for his miracle Preakness Stakes win. We will never know how Alfeet Alex would have been as an older horse, but he daughter Iotapa only seems to be getting started. 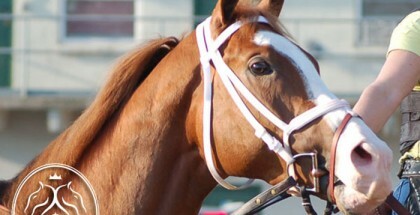 She is lightly raced for a four-year-old, with a 11-5(2)-4-1 lifetime record. Only off the board once in her eleven race career, Iotapa last won a race in the G1 Vanity Handicap, which was also her first grade one win. 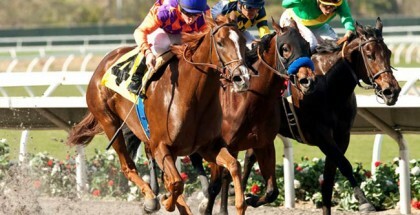 She was already a grade two stakes winner when she won the Santa Maria at Santa Anita. The one time Iotapa traveled outside of California, which produced her only off the board finish, which came in the Humana Distaff at Churchill Downs. 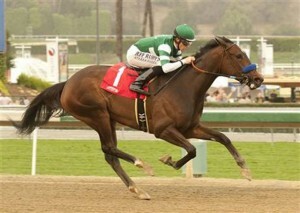 She returned to Santa Anita to achieve her first grade one win. Iotapa doesn’t seem to be stopping anytime soon, and I think she can dominate here, to earn her spot in the Breeders’ Cup Distaff. If she were to win this race and get into the Breeders’ Cup Distaff, Iotapa would have no problem with the extra 1/16 of a mile. By sire Afleet Alex, out of a El Corredor mare. Her third dam is by Wild Again, the first Breeders’ Cup Classic winner. I am not saying Iotapa can live up to the heights her sire and maternal great-grandsire, but winning the Clement L. Hirsch would be a very big step in the right direction. Post time for the 2014 Clement L. Hirsch is at 5:30 PM PT and is the 8th race of the day at Del Mar.